Orders must be received by June 15, 2010. This is expected to be the final printing. The price is the actual cost of making the printing and no profit is included. The book is comprehensively researched and documented. 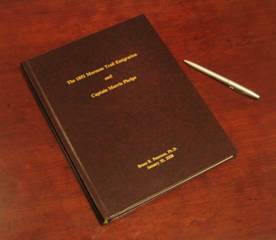 It is printed with color graphics on archive quality paper and hard bound in a leather cover, making it heirloom quality. It is well over 200 pages in length. Many of the graphics are original. The story of this emigration has never before been recorded in its entirety. These pioneers took an alternate route, the “Elkhorn Route”, which has never before been identified in detail. Included below are the Preface and the Introduction from the book, as well as a sample graphic. The author began this work with the intention of developing a chapter for a book on the history of his ancestor, Morris Charles Phelps. The story was more involved than anticipated and that one chapter grew into an entire book. In 1851, Morris was a captain of a wagon train, leading Mormon emigrants from Kanesville, Iowa (near Winter Quarters) to Salt Lake City, Utah. Few written accounts have come to light from persons directly involved with his wagon train company. Fortunately, the author was able to piece together a puzzle from accounts written by persons who were in nearby trains that frequently interacted with Phelps. To discover how the pieces fit, and to write the history of the Phelps Company (wagon train), it was necessary to reconstruct nearly the entire 1851 Mormon emigration. Many key pioneer writings do not identify precise time and place for events, although some do. 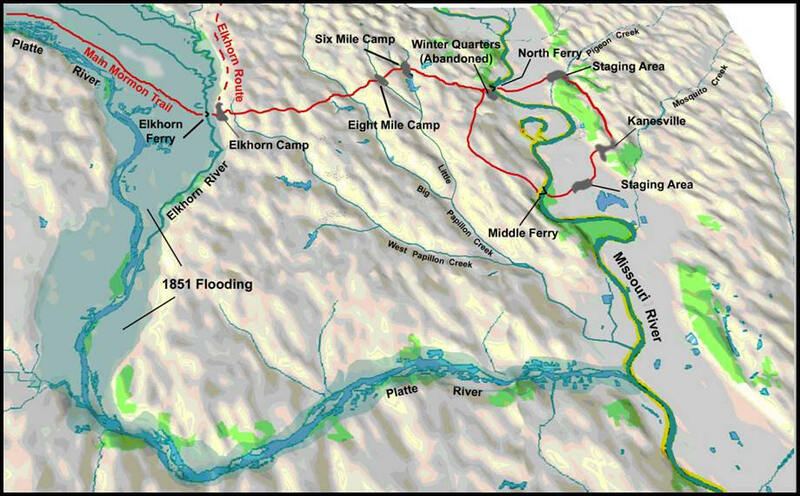 The author put the pieces of the puzzle together by comparing combinations of matching geographic descriptions, comparing matching event descriptions, evaluating time lapses, calculating rates of travel, evaluating maps for potential camping places or water crossings, comparing accounts of weather to get dates, etc. The accounts are often ambiguous but processes of elimination of alternatives led the author to be able to answer many questions. One key question answered was the path of the alternate route taken by the 1851 pioneers. The result of the pieced together puzzle is this book, containing accounts and maps that detail the emigration. The work took on a life of its own, much larger than intended for a chapter of a book. Consequently, the history told herein comprehensively covers the entire 1851 emigration, while maintaining an emphasis on the Morris Phelps Company. The author chose to let the pioneers tell their own story as much as practicable, relying heavily on quotations. He added structure, narrative, maps, figures, and tables in order 1) to integrate the numerous accounts into a single record, 2) to place the events in historical perspective, 3) to help resolve inconsistencies among the accounts, and 4) to make the story more readable. Following the martyrdom in 1844 of the Prophet Joseph Smith and his Brother, Hyrum, Brigham Young became the leader of the Church of Jesus Christ of Latter-day Saints, known as the Mormons. In 1846, due to increasing hostilities against the Mormons, Young led a migration of epic proportions from the city they had built, Nauvoo, Illinois, to a city they would build, Salt Lake City, Utah. They called their new home Zion, reflecting their belief in being called of God to gather. Tens of thousands made this migration prior to the completion of the transcontinental railroad in 1869. They moved mostly by oxen train, herding their cattle along with them. Due to difficult traveling conditions and complex logistics the migration could not be completed in a single year. The vanguard pioneers reached Salt Lake City in 1847, but many would not arrive until years later. A large and continuing number of new converts from the eastern United States and from Europe added to the stream of Mormon emigrants. Most of the Nauvoo refugees completed the trip by 1852 with converts continuing thereafter. Because Illinois mobs drove the entire population of Mormons from their Nauvoo homes in 1846, the Mormons needed to establish temporary communities along their exodus trails. Thus temporary communities sprung up across Iowa, with many of those being near the Missouri River in the western part of the state. These western communities were centered on Kanesville (later called Council Bluffs), Iowa. During the winter of 1846-47, before the initial push to what would become Utah, the primary village was called Winter Quarters, located on the western bank of the Missouri River in Indian Territory (present day Omaha, Nebraska). Those who did not go on to Utah in 1847 or 1848, moved back across the river from Winter Quarters to Kanesville and to surrounding communities. There they prepared wagons, raised stock, grew food crops and obtained provisions, helping their brethren and sisters while waiting their turn to go on to Utah. Morris Phelps and his family were among those who remained in Kanesville . He remained partly because of his poverty from being driven by the religious persecution heaped upon the Mormons multiple times: from Independence, Missouri in 1833, from Clay County, Missouri in 1835, from Far West Missouri in 1838, and finally from Nauvoo in 1846. He also remained partly by assignment to prepare the way for others, as well as for his own family. He helped the preparation by building wagons. By 1851, the Church leaders were pushing to bring the rest of the Saints in from the Kanesville area. Later in the summer, the First Presidency issued a directive to all those remaining to come to Salt Lake City, and in 1852 nearly all did. Beginning in 1849, after the discovery of gold in California, the number of immigrants along the Mormon/Oregon/California trail increased dramatically, as did the associated commerce in Kanesville. This both helped and hurt those remaining in Kanesville. The increased commerce helped them to pull out of extreme poverty, but it also caused competition for scarce resources and drove prices up, making it hard for the Mormons to continue their journey to the west. By the spring of 1851, Mormons had developed the trail between Kanesville and Salt Lake City relatively well as compared with the initial 1847 migration. They understood camping places, fuel locations, and trail obstacles. They had mitigated and prepared for problem spots on the trail. Morris Phelps and hundreds of others were ready to go. Their plans took a dramatic upset when before most of them could get started, an unusually wet spring forced them to alter their route. The Elkhorn River has its confluence with the Platte River some 19 miles west of the abandoned Winter Quarters. In previous years, the Mormons had built a ferry on the Elkhorn to get the emigrants across, but in 1851 the water swelled to a deluge, up to 16 miles wide. Thus at the direction of Apostle Orson Hyde, who was directing operations from Kanesville, many of the companies (wagon trains) decided to "head the Horn", meaning to go northwesterly up the Elkhorn River on trails that were neither established nor charted (refer to Figure 2). The route eventually worked back to the original Mormon Trail in the middle of Nebraska. For purposes of this history, the author has dubbed this route as the “Elkhorn Route”, and the route as described by William Clayton  as the “Main Trail”. They did not know how horrible the Elkhorn Route would be. The stage was set for a migration as dramatic as any that ever crossed the plains by oxen company. This journey to Zion is a story of trials: of suffering from Indian depredations; of the horror death by stampedes, by lightning, by illness, by childbirth, and by murder; of the extreme burden on man and beast of sandhill desert crossings; and of the consternation of revolts against captains. On the other hand it is a story of glory, of spiritual growth, of endurance, of valor, and of the immense joy of reuniting with the Saints in Zion.